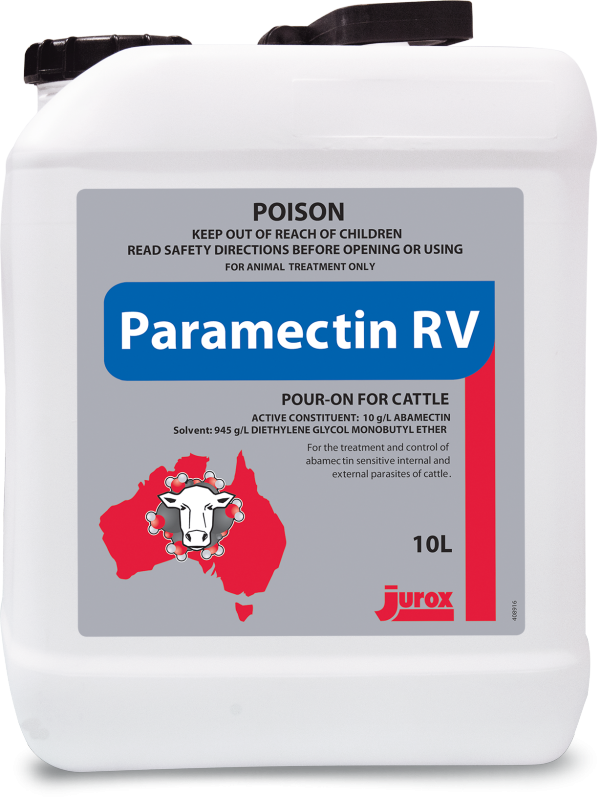 Abamectin in a low volume formulation that provides a broad spectrum of efficacy against sensitive strains of adult and immature internal and external parasites of cattle. acquired up to 14 days after treatment. Strongyloides papillosus - Intestinal threadworm. Dictyocaulus viviparus - Large lungworm. Controls infection acquired up to 28 days after treatment. Bovicola bovis - Biting louse. Solenopotes capillatus - Little blue sucking louse. Haematobia irritans exigua. Controls buffalo fly and protects cattle from reinfestation for up to 14 days after treatment. Meat: DO NOT USE less than 35 days before slaughter for human consumption. DO NOT USE less than 42 days before slaughter for export. DO NOT treat calves under 50 kg.